Seitengewehr 84/98 - or better known as bayonet 98k - is the proof of a genuine, outstanding blade that served among all arms of die Wehrmacht. From the beginning to the end. 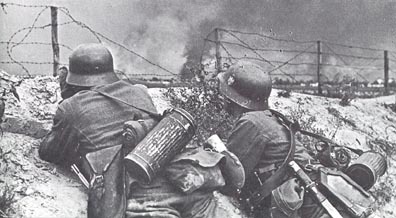 In almost every other aspect the various 'Waffengattungen' - from the Kriegsmarine to the Waffen SS - were busy developing, designing and issuing their own camouflage and equipment - even through the defeat and retreat until the final collapse in May 1945. That makes the Seitengewehr 98k remarkable and unique: It kept it's full integrity during the entire war. 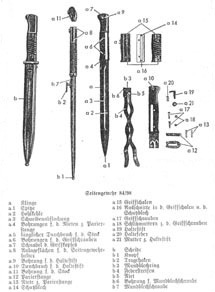 The bayonet 84/98 in various appearances. Note differences in materials used and surface coat, depending on manufacturer, date of issue and the quality of steel available. During the war a larger number of bayonet frogs in the various materials were introduced: Leather, presstof, canvas and webbing - and a mix of all four types - has been observed. 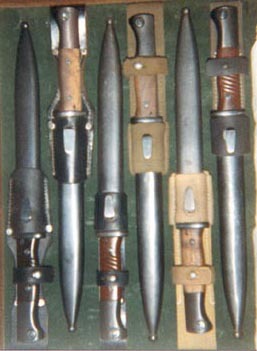 Since 1936 several models and types were adapted officially by die Wehrmacht: Model 36, 40, 42 and 44, with or without the hilt strap. Three unusual bayonet frogs. The left and the right speciment are manufactured in strong black rubber coated canvas material, which makes them strong and water resistent. This type is usually marked C. Riese, Berlin C2, 1941. The purpose of this type is unknown. The center speciment is very scarce: Manufactured in a grey blue colored web material and used by the Luftwaffe. The sand-kaki DAK standard all-web frog w. hilt strap. Rare version of A, no hilt strap and a stronger front section. Late version of the DAK frog in web - leather with hilt strap. Variant of C. Hilt strap placed diffrently. Front part in leather. Odd variation in breadbag like material. Late war specimen. Model 40 black leather frog w. alu rivets. No hilt strap. Standard model 40/42 black leather frog. No hilt strap. 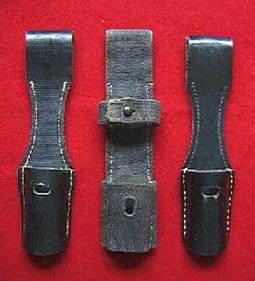 Variant in impregnated canvas, leather and no hilt strap. Light brown model 40 leather variant w. rivets and hilt strap. Variant of I. Note hilt strap and alu rivets. Prewar manufacture. Leather frog, 1942, for the new entrenching tool. No hilt strap. Same type and model as K. but with hilt strap. Late war specimen. A mix of various scrap leather materials. M. in profile. It has open side pieces of the front portion. Variation of M and N. with hilt strap.